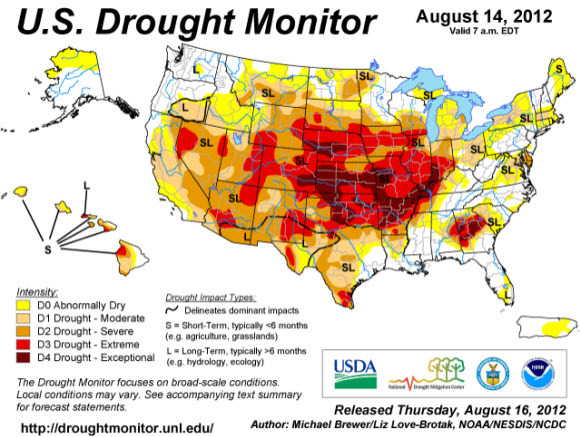 This is an important update on the U.S. drought of 2012, the combined record-setting July land temperatures, and their impact on food prices, water availability, energy, and even U.S. GDP. Even though the mainstream media seems to have lost some interest in the drought, we should keep it front and center in our minds, as it has already led to sharply higher grain prices, increased gasoline costs (via the pass-through of higher ethanol costs), impeded oil and gas drilling activity in some areas (due to a lack of water), caused the shutdown of a few operating electricity plants, temporarily reduced red meat prices (but will also make them climb sharply later) as cattle are dumped in response to feed- and pasture-management concerns, and blocked and/or reduced shipping on the Mississippi River. All this and there's also a strong chance that today's drought will negatively impact next year's Winter wheat harvest, unless a lot of rain starts falling soon. There are steps that everyone can and should take to become more food- and fuel-resilient in case the drought persists – as some experts think is quite possible – into next year and perhaps a few more. We'll get to those steps shortly. Further, there will be a definite impact to U.S. GDP, which could add to pressures (excuses?) that the Fed may use to justify additional quantitative easing (QE) measures (otherwise known as 'printing more money'). The drought in the United States is continuing to intensify, according to the National Oceanic and Atmospheric Administration (NOAA). The latest Drought Monitor says 61 percent of the contiguous United States faces moderate or worse drought conditions this week. Nearly 30 percent is experiencing extreme to exceptional drought, exceptional being the most severe category. Officials say the amount of land that's currently affected across the U.S. is larger than the entire state of California. In this next image, it is notable that the areas of the highest drought classification -- 'exceptional' -- have dramatically expanded from the prior week (the August 7, 2012 report). Much of the drought is centered squarely over the U.S. 'breadbasket' region and has really dented this year's harvests in a big way. Certainly the number one story around the U.S. drought centers on its impact on grain production, specifically corn and soybeans. In a minute we'll discuss the other impacts, but we'll start with the one that has the greatest potential to cause both suffering and strife over the coming months (and possibly years), especially for those on limited budgets. In 2011, the U.S. reaped a corn harvest of some 314 million tons. In 2012, the USDA has estimated a harvest of 274 million tons – a shortfall of 40 million tons – despite record acreage being planted. Initial reports from the closely watched Pro Farmer Midwest Crop Tour suggested more crop damage than expected from the drought, raising the potential for diminished soybean production this fall and sending futures sharply higher. The disappointing crop reports from scouts touring fields on the Pro Farmer crop tour in states such as Ohio and South Dakota make it hard to believe soybean yields will reach current U.S. government crop projections, said Don Roose, president of advisory and brokerage firm U.S. Commodities in West Des Moines, Iowa. The market is in the "watch and worry" mode on all fronts as shrinking crop forecasts will further tighten supplies already projected to dwindle to precariously tight levels in 2013, Mr. Roose said. On the annual Pro Farmer tour, analysts and investors walk corn and soybean fields in seven Midwestern states over four days to assess prospects prior to the fall harvest. Pro Farmer is an agricultural advisory firm. The Pro Farmer tour, which wraps up Thursday, reported diminished potential for the soybean crop in both Ohio and South Dakota. The crop tour doesn't estimate soybean yields, but it reported an average 584.9 pods per 3-foot-by-3-foot square area in South Dakota, down 47% from a year ago. In Ohio, scouts reported soybean counts at an average of 1,033.72 pods per 3-foot-by-3-foot square area, down from 1,253.2 pods a year ago. Soybeans entered their critical growing phases in recent weeks, and the crop has benefited in some regions from recent rains across the eastern Farm Belt. Meanwhile, scouts with the Pro Farmer Midwest Crop Tour on Monday reported an average estimated corn yield in Ohio of 110.5 bushels per acre, down from the tour's estimate of 156.3 bushels a year ago. In South Dakota, tour scouts reported an average yield estimate of just 74.3 bushels per acre, down from 141.1 bushels a year ago. While commodities traders and agronomists have braced for weeks for the prospect of a crop decimated by drought, the estimates were lower than many had expected. The summary here is that the Pro Farmer Tour is reporting crop yields to be 2% - 3% lower than current USDA forecasts, which is a big deal when it comes to food. We're talking a few tens-of-millions-of-bushels' difference. The somewhat sour note in this unfolding drama is the fact that 40% of the nation's corn crop goes to ethanol producers, which means that food will be burned in the nation's auto fleet instead of helping to keep prices down for consumers and animal feed. Another 40% goes to animal feed (chicken, cattle, hogs, etc. ), and the remaining balance goes to direct human consumption. However, the ethanol mandate is a congressional requirement for our fuel blenders, so they do not have a choice in the matter. It would literally take an act of Congress to even temporarily suspend the ethanol requirement – and in an election year, that's just not going to happen, given the powerful constituencies invested in preserving that mandate. Of course, higher input costs will ripple through the entire chain, so perhaps Bernanke will get the inflation he seeks, although it won't be the one he wants. The inflation he wants is simple monetary-driven inflation. The inflation he will get is nothing more than a supply/demand mismatch. The USDA has a formula for predicting changes in the rate of inflation caused by gains in prices at the commodity level: if the farm price of corn rises 50%, retail food prices rise by 0.5% to 1% as measured by the Consumer Price Index (CPI). The price of September corn futures from mid-June until early August advanced 55%, meeting the USDA’s criterion for a measurable increase in the CPI Lapp presented a more extreme scenario than the USDA. He predicted that the damage to the 2012 corn crop will translate into a food inflation rate of 4% to 5% in 2013. In his view, the dollar cost of the drought already was $30 billion, which accrued rapidly over the summer. He said high feed costs will have to be absorbed by producers, who will likely liquidate part of their cattle and swine herds and poultry populations. At the retail level, the drought’s effects will translate into narrower margins — and expected higher prices — for processed food and soft drink manufacturers among others. Lapp offered his opinion that legislation that has effectively required 40% of the corn crop be used in making biofuels has made everything worse. “The situation has been aided and abetted in a negative way by the biofuels mandates,” he said. “Shame on us for having mandated so much to corn ethanol” without creating contingencies for a bad crop year. Because corn is the base unit for so many things (especially in the form of high-fructose corn sweetener), and because it's a primary feed component for finishing cattle and raising chickens and hogs, it tends to have a pretty decent impact on food prices. However, it takes time for those price hikes to work through the system. So it will not be until 2013 sometime that we really begin to feel it in the U.S. And for the rest of the world that lives more directly on grains? They're not as lucky. The price hikes hit them almost immediately. (Reuters) - Two leading Russian agricultural analysts cut their forecasts for Russia's grain harvest on Monday after harvest data from two drought-stricken eastern growing regions reduced the outlook for the overall crop. The government's official grain harvest forecast is 75-80 million tonnes, of which 45 million tonnes could be wheat. The government has put this season's exportable surplus at 10-12 million tonnes, a level seen by traders as an informal cap on exports. The government has tried to reassure markets there will be no repeat of August 2010, when Russia's government shocked markets with a snap decision to ban grain exports when the scale of losses from major drought became clear. The government has indicated that protective tariffs could be an option, though only after the end of the calendar year. But traders widely expect limits to be imposed in some form, perhaps as early as November, after heavy exports in the early months of the season showed Russia could hit the 10-12 million tonne mark sooner than January. Russia is still officially projecting 75-80 million tonnes but may only get 71 tonnes. If the projected exportable surplus is 10-12 million tonnes, but Russia actually harvests 9 million tonnes less than their hoped-for projection, then its exports will have to decrease to plug that gap. Here's the kicker: Russia has already exported a good deal of that amount. That is, the prospect of another Russian export ban this year is quite realistic. 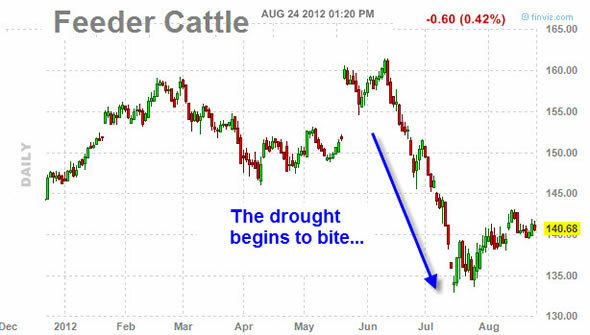 If we get one, then we can expect a repeat of the turmoil in the grain markets that we saw in 2010. But there's another much more fundamental reason why we can expect higher prices going forward. The good news is that there's still plenty of supply to carry us through to the next harvest. However, demand is going to have to go down some, and the way we accomplish that is through the price mechanism. Right now, physical grain traders are saying that prices are too low and that unless they rise, we're going to run out of grain before the next harvest. Obviously, that's not truly going to happen – increasing scarcity will cause prices to rise until current demand levels are reduced. Corn prices surged this month to an all-time high of $8.4375 a bushel on the back of the worst drought in the US in nearly half a century. But prices have since fallen roughly 5 per cent. The impression is the rally has run out of steam. This is far from the real picture. Prices need to rise again – probably setting all-time highs – to dampen consumption that is running ahead of supply. If demand does not slow down, silos will be all but empty before the next harvest arrives in late 2013. On paper, the balance sheet for corn supply and demand published by the US Department of Agriculture seems good enough. But in practice, the numbers look a bit shaky. The agency, whose figures are closely watched by the market, first estimates supply and, after that, adjusts the demand data to maintain a minimum level of inventories. This time the USDA is asking for monumental rationing on the demand side. For example, US corn feed and export demand will need to drop to their lowest levels in nearly 20 years. The USDA is also forecasting lower ethanol production – and thus corn demand. Ethanol output has fallen, but not nearly enough. Worse, the rise in wholesale petrol prices back above $3 a gallon means that ethanol producers are profitable again, even when paying record corn prices. Corn is now trading just above $8 a bushel – but traders in the physical market say that prices need to rise to $9-$10 to force demand down enough to meet the consumption levels anticipated by the USDA. The retreat in corn prices over the past couple of weeks has given inflation watchers a false sense of security. The market should not relax, however. More food inflation is just waiting around the corner. The idea here is that the cash market will have to lead the futures market higher, an odd situation because it is usually the other way around. With so many hedge funds now playing in the commodity space, one explanation is that they are simply playing paper games with each other – those playing the short side will get a lesson in the importance of keeping one eye on reality. A truly shocking event would be if the U.S. ever gets to the position of limiting exports of corn or even soybeans. That is a very unlikely proposition to consider, but if the silos get drained because we have dysfunctional markets that saw fit to keep prices bizarrely low while our free trade agreements allow the too-low grains to be exported, threatening domestic supplies, then that possibility notches up a little bit. While it is clear that basic grain prices are heading higher, the knock-on effects into other soft commodities are a little less clear, but are definitely still important to consider. The withering crops are translating into higher feed costs for livestock producers. "This is different than anything I've ever experienced," said Kent Pruismann, who raises cattle and hogs on a farm in Sioux County, Iowa, and saw his costs for feed jump by 20% in July. The higher corn, soybean and wheat prices will reach food makers, exporters and eventually consumers. Drivers already have seen fuel costs climb because of higher prices for ethanol, a corn-based fuel that is blended into gas. The drought also has reignited the debate over whether ethanol production is a drain on global food supplies. LOUISVILLE, KY (WAVE) – When you think of cattle feed, you probably don't think of candy, but due to the drought that's exactly what one farmer chose to do. At Mayfield's United Livestock in Western Kentucky, owner Joseph Watson feeds his herd second hand candy. Watson started feeding his cattle the candy because corn prices were so high. He mixes the candy with an ethanol by-product and a mineral nutrient. He monitors the daily intake and said the cows have had no real health issues. Yes, the higher grain costs are going to hit everything from big cattle feedlot operations to my own two-bags-a-month chicken-feed usage. Widespread drought has scorched much of the pastureland and hay fields needed to sustain cattle herds in the U.S., forcing many ranchers to find feed alternatives or sell their animals early into what has become a soft beef market. The shortage has led to higher hay prices, with some farmers saying they have to pay two to three times last year's rates. Despite farmers setting aside more land to grow hay this year, they are still producing a lot less because of the drought, according to a recent Department of Agriculture estimate. The harvest of alfalfa, generally considered to make the best hay because of its high nutrient levels, is forecast to be the worst since 1953, according to the USDA. Pasture grass and hay are what most cattle are fed for the roughly two years they live before being slaughtered, but the drought is threatening to starve the animals. Illinois rancher Steve Foglesong said that most years he could graze his cattle from spring through November on verdant fields that are now brown, buying them hay bales only in the winter. This year, he and his animals have their eyes on withered corn plants. "It may not have any ears on it, but it makes pretty good cow feed," he said. John Erwin, who owns 20 acres of land in Shelbyville, Ill., said he is having trouble growing alfalfa hay, but demand is strong for what he can produce. "I'm getting calls from ranchers as far away as Wyoming," Mr. Erwin said. "They're desperate." He said he has been offered $250 a ton for his hay, nearly double the $130 a ton in a non-drought year. His fields didn't produce any hay in July. A doubling of hay prices is obviously going to create quite a bit of economic hardship for many farming operations, which tend to be marginal profit businesses even when everything is going well. The drought has done some very serious harm to the nation's hay supply that goes beyond the economics of higher hay costs. First there's the supply of the hay, and then there's the relatively poor quality of hay that was taken from non-irrigated, drought-stricken fields. All in all, it's not a good situation. COLUMBIA, MISSOURI, U.S. — Tim Evans, an associate professor of veterinary pathobiology and toxicology section head at the Veterinary Medical Diagnostic Laboratory at the University of Missouri College of Veterinary Medicine, Columbia, Missouri, U.S., warns U.S. farmers and livestock producers that drought-damaged corn plants can pose a risk to animal health. “During severe drought conditions, corn plants, especially those heavily fertilized with nitrogen, can accumulate a chemical called ‘nitrate’,” Evans said. Evans also says that many naturally growing plants and weeds in grazing pastures can accumulate nitrate during drought conditions, as well. These plants include many types of grasses and some weeds, which animals might be forced to eat because of limited pasture or hay available as forage for livestock. The key here is that nitrates are safe below 2,000 ppm but toxic above 15,000 ppm, and the levels found in the stalks and how high it travels are a function of whether enough rain fell to allow the plant to take it up. Much of the corn crop was so desiccated that the plants could not even manage to draw up this nutrient, and therefore it is safe as a feed product. Many ranchers and farmers are faced with a horrible choice here. Saving their herds may be economically unsound or even impossible where hay and safe silage are not available, and so they are selling their herds, one of the most heart-wrenching decisions anyone could have to make. So many are doing this that recently the price for cattle has dropped, as everyone is selling into an increasingly soft market. My advice is to enjoy these low meat prices while they last, because the next stage of this story involves much higher meat prices. The problem with understanding just how bad the hay situation might (or might not) be is that there are no national statistics collected that could tell us whether or not there's even enough hay available to sustain the current commercial and recreational livestock populations. So, with all of these repercussions building during the current drought – to which there's yet no end in sight – what can you do today to minimize their impact on your budget and lifestyle? Part II: Positioning for the Drought's Aftermath looks at the likeliest outcomes in food prices, food availability, energy prices, and macroeconomic consequences (of which there will no doubt be many from this drought). We have a national food distribution system that runs significantly on a just-in-time basis, which leaves it vulnerable to price and inventory shocks when there are supply disruptions. The reduced water levels caused by the drought are handicapping electrical power generation in growing regions in the country; electrical thermal plants are the number one biggest user of water in the U.S. The global financial markets are similarly tenuous these days, as resources are already taxed in trying to stimulate the moribund U.S. economy and dig Europe out of its massive credit woes. This is one of those moments where taking simple, prudent steps now can have an outsized effect on preserving your quality of life. If you eat meat and have room in your freezer, now is a good time to stock up on meat! Haven't sold any new crop yet (2012) of corn or soybeans. Still have some old crop (2011) likely going to be selling the last of over the few weeks. Similar successful Iowa farmers are mirroring our actions. So...do see higher prices. My take is still 9-10 dollars for corn and 18-20 soybeans (stated this in earlier posts). Average Corn yields of 120-170 bu/acre...lowest since 1988. Field yields will be highly variable. Average Soybean yields of 50-65 bu/acre...near long term averages. 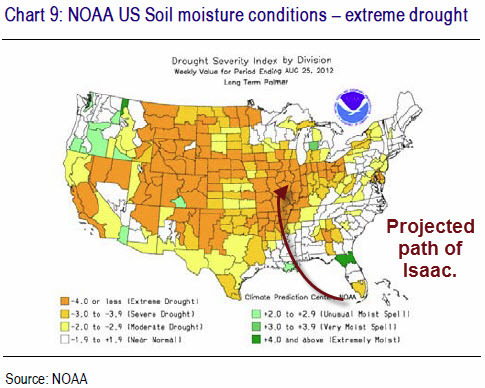 BTW...2013 is encouraging toward seeing better growing conditions (in previous posts forecast dryness for USA in spring 2011 for 2011 and into 2012). There's a substantial body of peer reviewed scientific literature that ties current and future drought to climate change, and that predicts far more severe droughts in the future. The links below examine several relevant studies. If you're interested in creating personal resiliency, you would be wise to incorporate the best possible climate modeling into your plans for the future. 2nd year people go hungry! 3rd year malnuturing and starvation,there will be deaths! let's all hope end in the frist year! "It would literally take an act of Congress to even temporarily suspend the ethanol requirement"
not so. The EPA has the authority to suspend/alter the ethanol mandate. Virginia Governor Bob McDonnell asked the U.S. Environmental Protection Agency to suspend the nation’s ethanol requirement, citing high grain prices.